Photo by Bryan Stevens A female Ruby-throated Hummingbird perches on a feeder during a visit last spring shortly after making her return in early April. 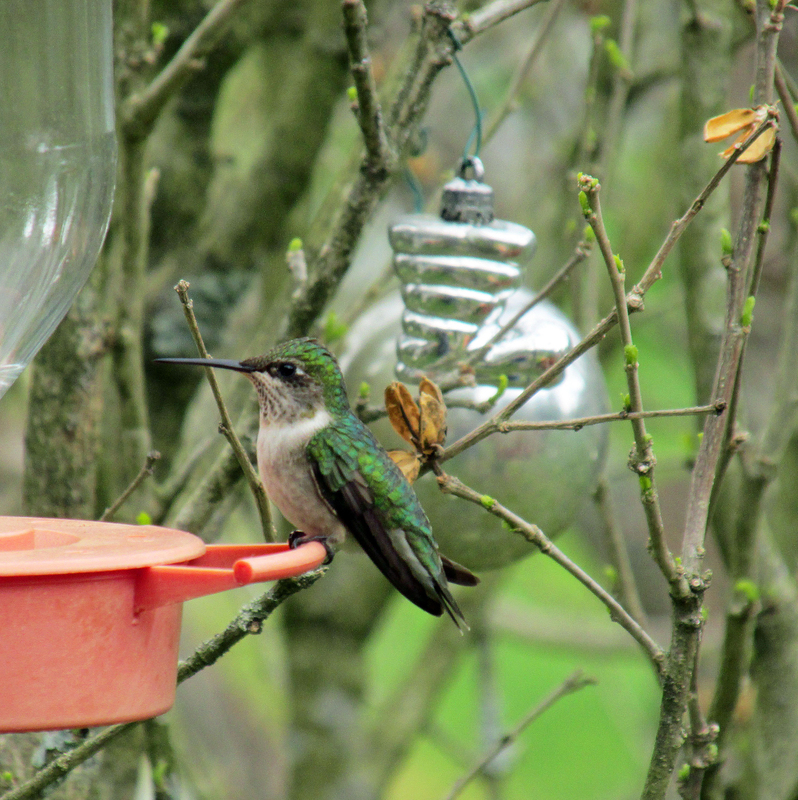 It’s time to start thinking about bringing the hummingbird feeders out of storage. These little winged favorites should be returning to yards across the eastern United States and Canada in the upcoming weeks. In fact, in some locations they’re already back. 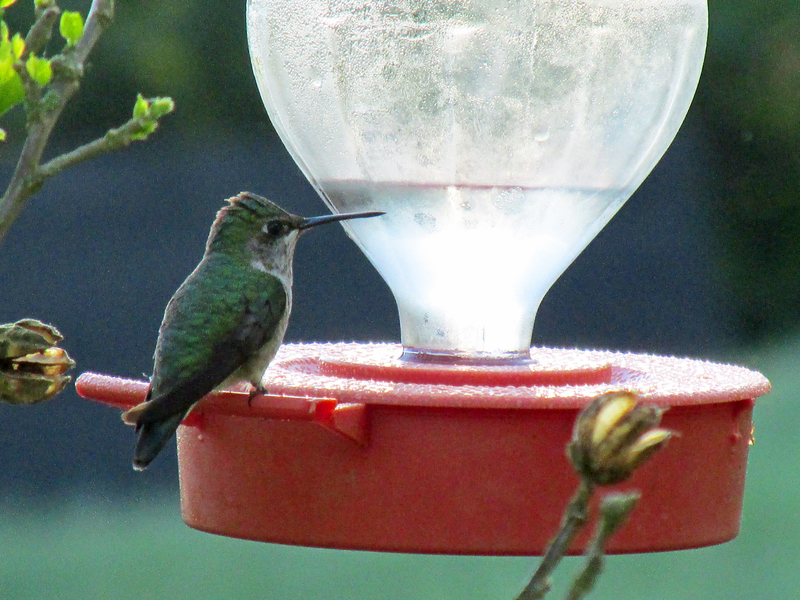 I usually hang out my own feeders the first week of April, but I often have to wait a week or two before I finally get a visiting hummingbird. 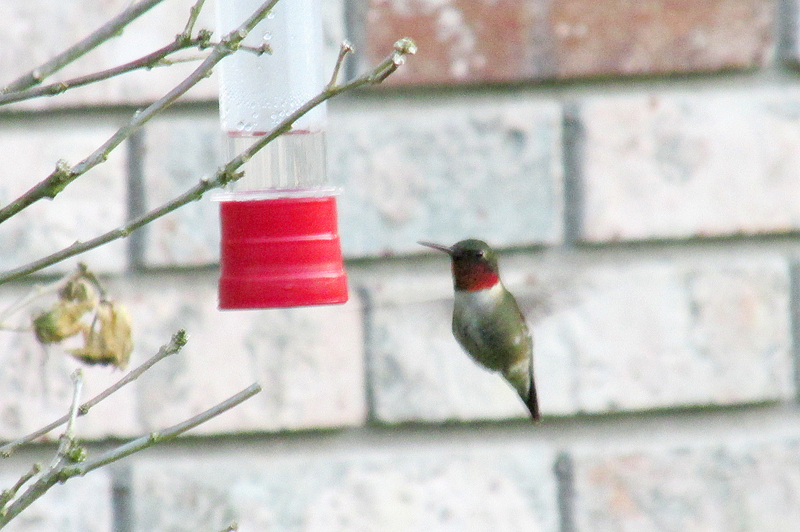 About the earliest I have ever known hummingbirds to get back is the first week of April. The dates around April 8 to April 10 seem a popular arrival date. For some people, however, it may be mid or even late April before they see one. Photo by Bryan Stevens Keep feeders filled with a solution made from one part sugar to four parts water to replicate the sweetness of flower nectar. You definitely increase your chances if you just have a feeder available with a fresh mixture of one part sugar to four parts water. This is the formula that closely matches the sweetness of nectar available from flowers. 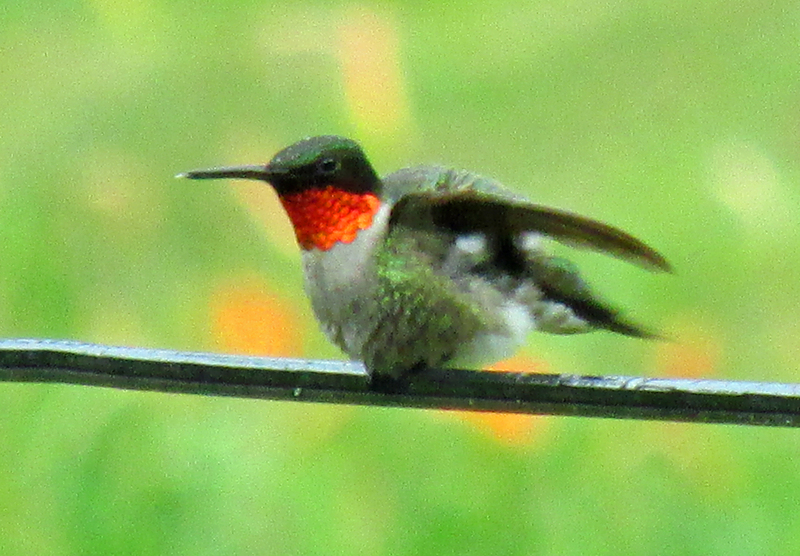 There’s always a temporary surge in the numbers of Ruby-throated Hummingbirds from mid-April to mid-May as many of these small winged wonders migrate through Northeast Tennessee. 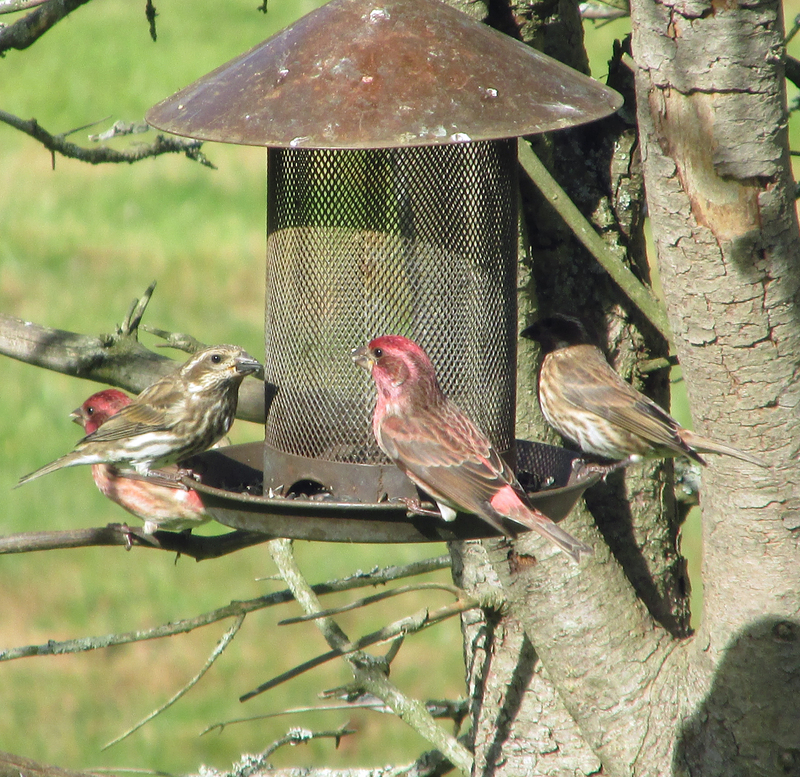 Many of these early arrivals are making only temporary stops at our feeders or in our gardens. The majority of them probably continue to travel farther north to spend the summer. Photo by Bryan Stevens Ruby-throated Hummingbirds undertake a long-distance migration to return to our yards and gardens every spring. Just to reach the United States, these tiny birds undertake an arduous journey. 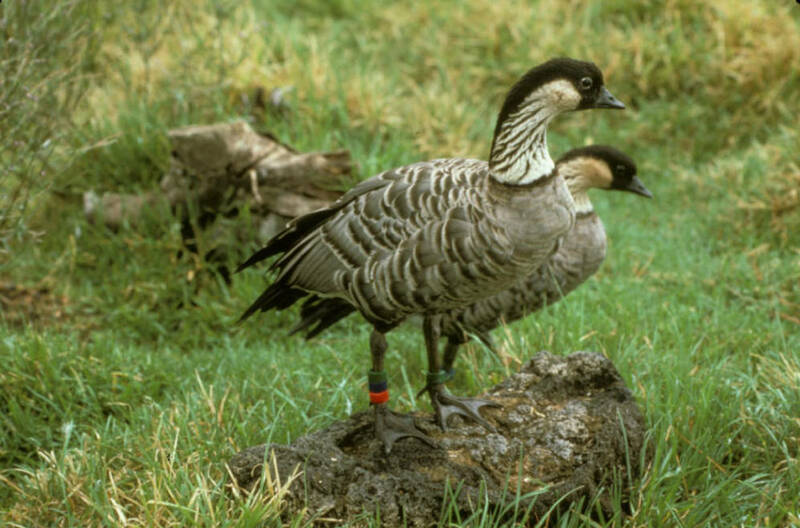 They leave their wintering grounds in Central America to return to the United States and Canada for the nesting season. Most of these tiny birds, which are barely four inches long, make a non-stop flight of more than 500 miles across the Gulf of Mexico. The journey can take almost an entire day! By May, the spring hummingbird migration is basically finished for the region. A few of the female hummingbirds, finding our yards to their liking, will conclude their epic journey here and spend the next few months tending to a new generation of hummers. Photo Courtesy of M.C. Campbell Two young Ruby-throated Hummingbirds share a crowded nest. She lays two eggs. There are some reasons why it’s always a pair of eggs. First, the nest is so small that there is barely room for two eggs, let alone more. 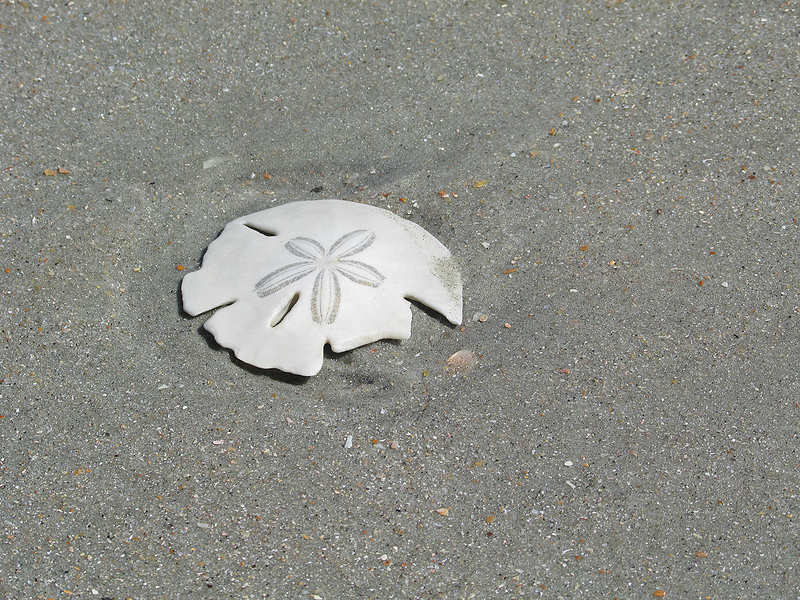 Second, once the young hatch, the nest has just enough room to accommodate them as they grow, fed well by their mother. Third, feeding two hungry young hummingbirds is a demanding task. A female hummingbird has to find enough food to fuel her own body and help her young in the nest grow and thrive. It’s a full-time job during the daylight hours. She’s pressed hard to succeed at raising two young. Attempting to rear more would most likely prove impossible. The entire process — from building the nest to incubating eggs to tending hatchlings — requires a commitment of more than two months. The female hummingbird builds her exquisite nest from lichen and various plant fibers, much of it held together by collected spider silk. Photo by Bryan Stevens A Ruby-throated Hummingbird selects a secluded perch. 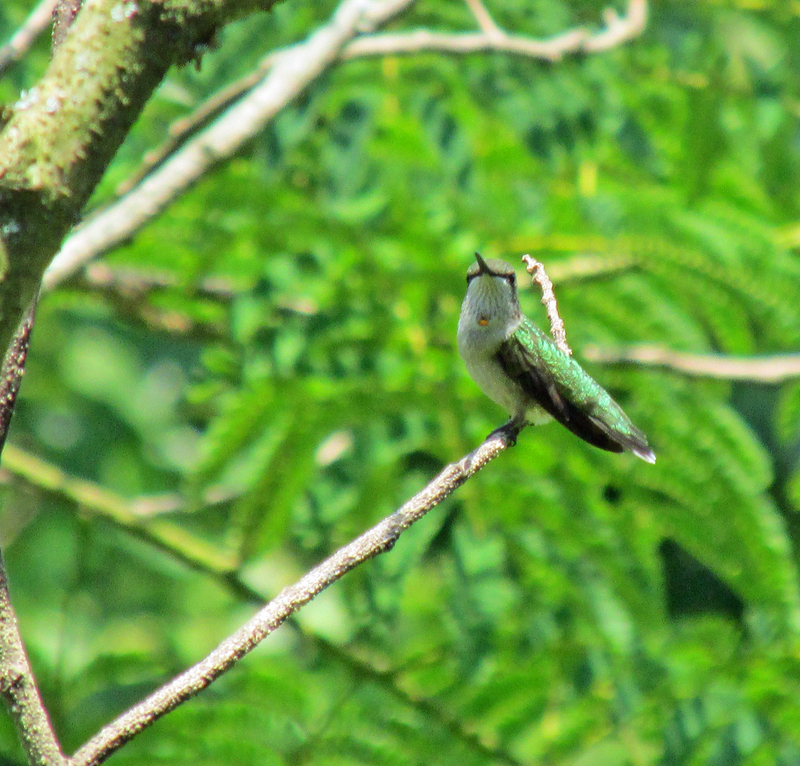 Once that time-consuming task is completed, the female hummingbird lays her eggs. She will spend about the next 18 days incubating them. Once they hatch, the young will remain in the nest about 28 days (nearly a month) and depend on their mother to bring them regular meals. 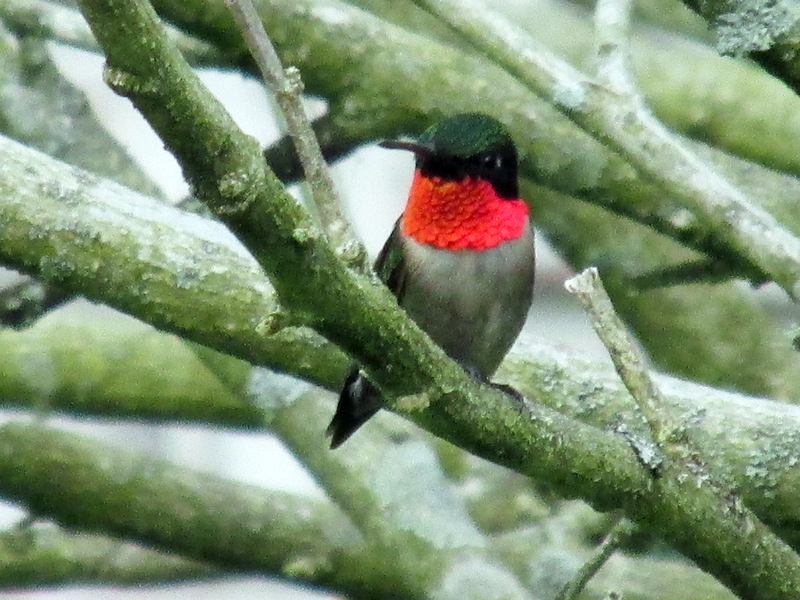 If that’s not enough, the ruby-throated hummingbird is known to nest twice in a season. 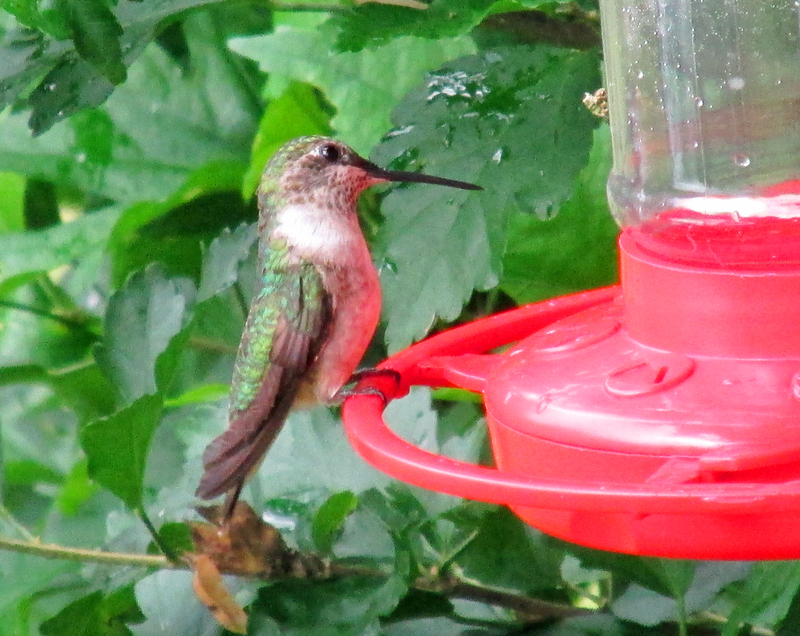 It certainly must rank a female hummingbird as one of the busiest of our summer birds. 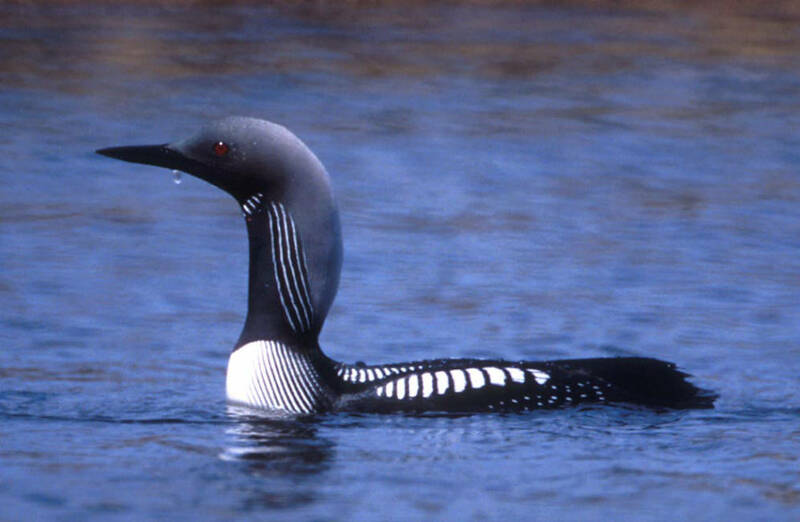 Of course, a few adult males will end their migration in the region. The males, however, don’t assist with the rearing of their own young. For male hummingbirds, summer is mainly a time to thrive on the abundance of nectar-bearing blooms, as well as a profusion of tiny insects and spiders that also make up a good portion of their diet. 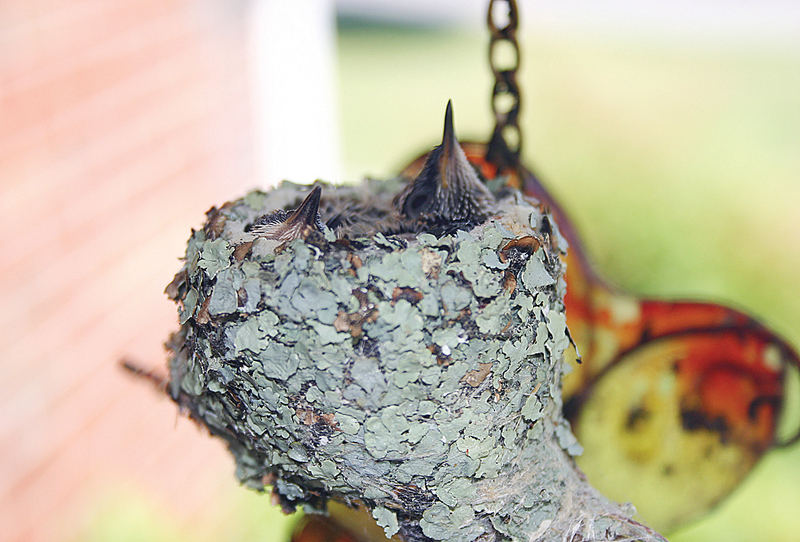 Photo by Bryan Stevens A hummingbird nest recovered after a successful nesting season. 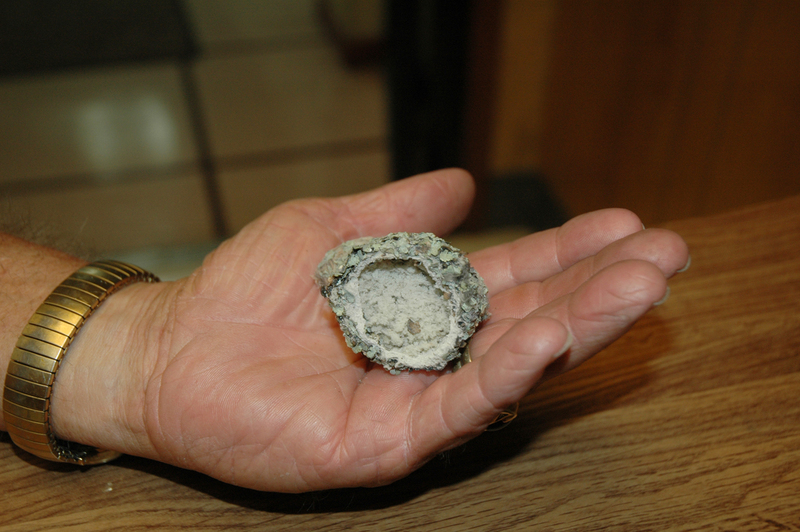 The photo shows just how small and intricate the nest of our smallest breeding bird is. If all goes well — and that’s not the case always, unfortunately — a new generation of hummingbirds may join the adults at feeders in late summer and early fall as a second wave of migration begins. Not surprisingly, hummingbirds face an assortment of predators that can prove detrimental to nesting success. Even prolonged periods of rain or cold weather can produce unfortunate consequences. 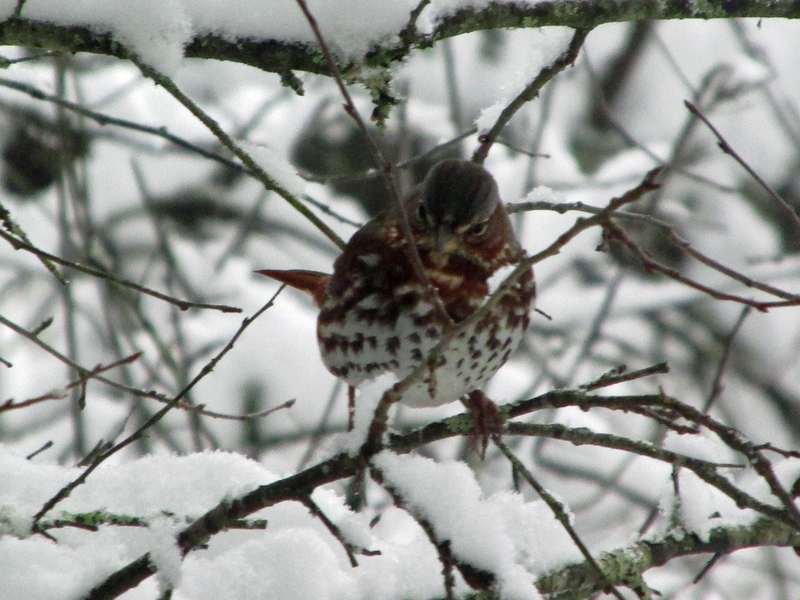 Nevertheless, these tiny birds manage to replenish the population each year, ensuring that they will be back in future spring seasons to delight and entertain hosts who have missed them through the bleak months of winter. Photo by Bryan Stevens Sunlight brings to vivid life the ruby-red throat patch, or gorget, of a male Ruby-throated Hummingbird. Photo by Bryan Stevens Feeders filled with sugar water or a garden planted with nectar-rich flowers can attract Ruby-throated Hummingbirds to your yard. I’ll post the arrival dates I receive in upcoming columns this spring. This is a tradition I have enjoyed observing for years, and I hope all the hummingbird fans out there will participate. I know I can’t wait for them to be back. I’m looking forward to hosting them again for another six to seven months before they once again depart this coming October to spend the winter in the tropics. Bryan Stevens lives near Roan Mountain, Tennessee. He has been writing about birds and the natural world for almost 20 years. 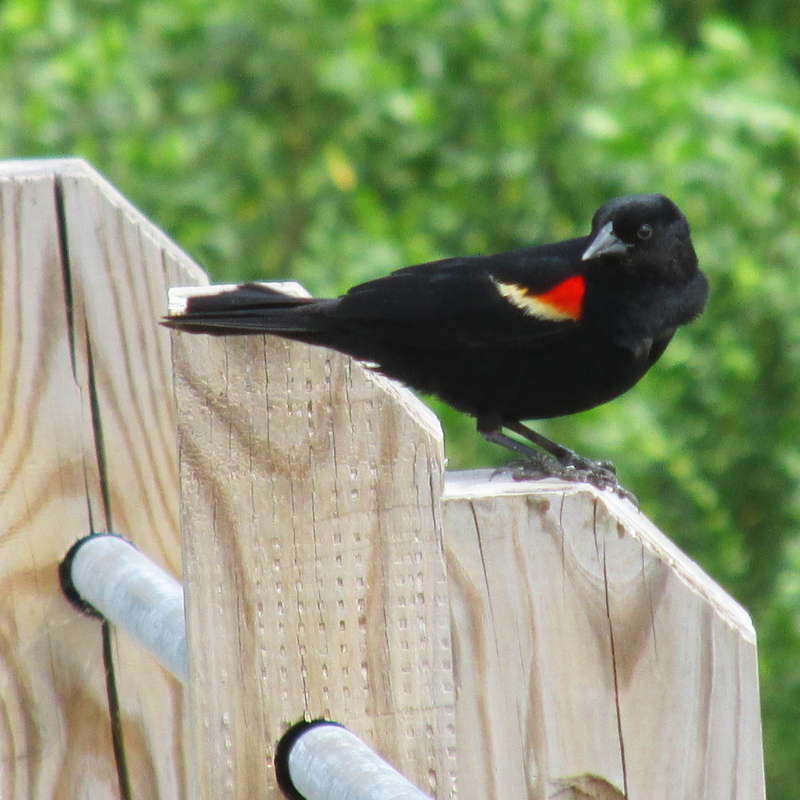 Some of his favorite birds include hummingbirds, shorebirds, warblers and owls. Photo by Bryan Stevens A Ruby-throated Hummingbirds remains alert while visiting feeders. 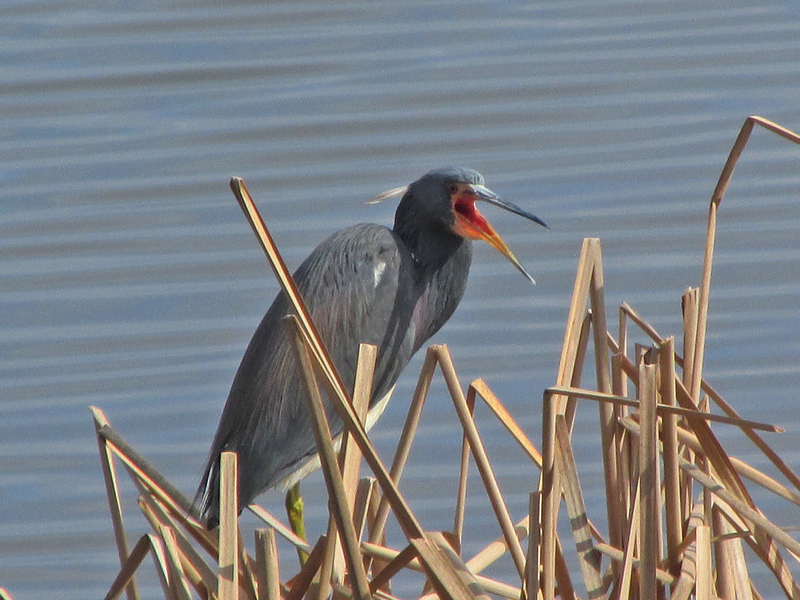 A Tri-Colored Heron gapes in the Carolina sunshine. These members of the heron/egret clan are coming into their nuptial plumage for the upcoming nesting season. During a seven-day state in Pawleys Island, S.C., I observed 100 species of birds, more than I could likely expect to find back in Northeast Tennessee at this time of the year. 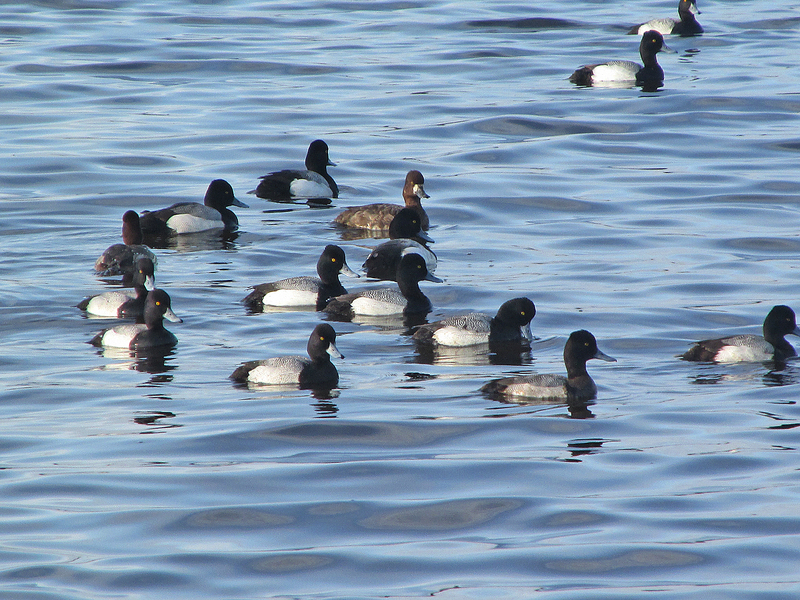 A raft of Lesser Scaup refresh in a shallow pond at Huntington Beach State Park in South Carolina. In early March, this diving duck was one of the most common in the park. 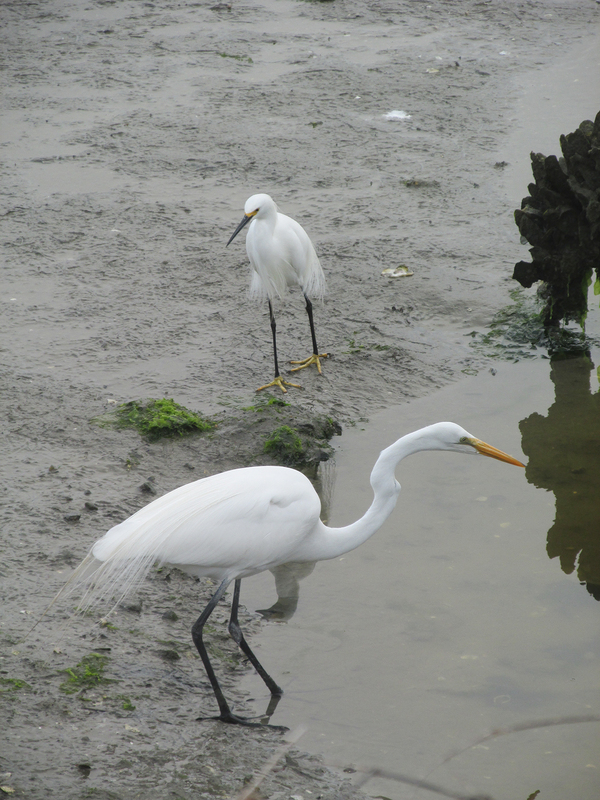 A Snowy Egret and Great Egret fish along the causeway at Huntington Beach State Park. 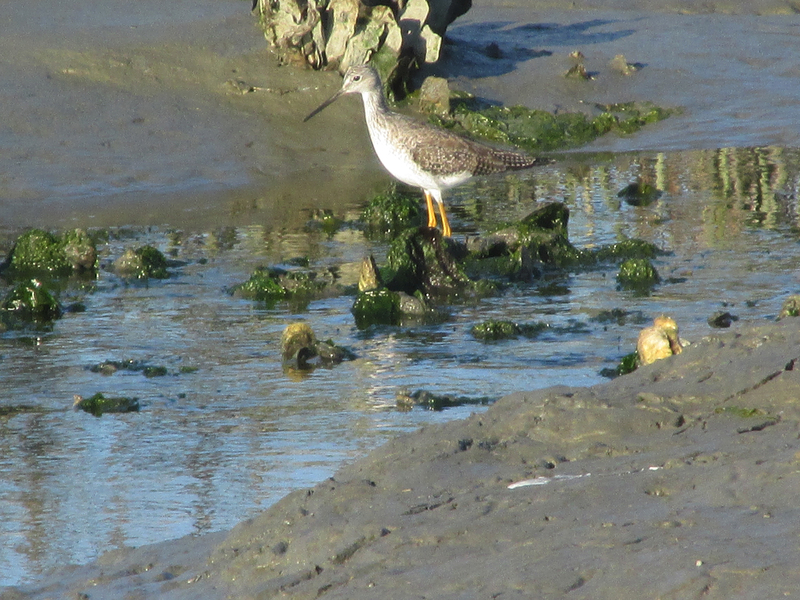 A Greater Yellowlegs forages in a tidal marsh pool during a migratory stop at Huntington Beach State Park. March is the month when many shorebirds start making their way as far north as the Arctic tundra for a brief albeit productive nesting season. 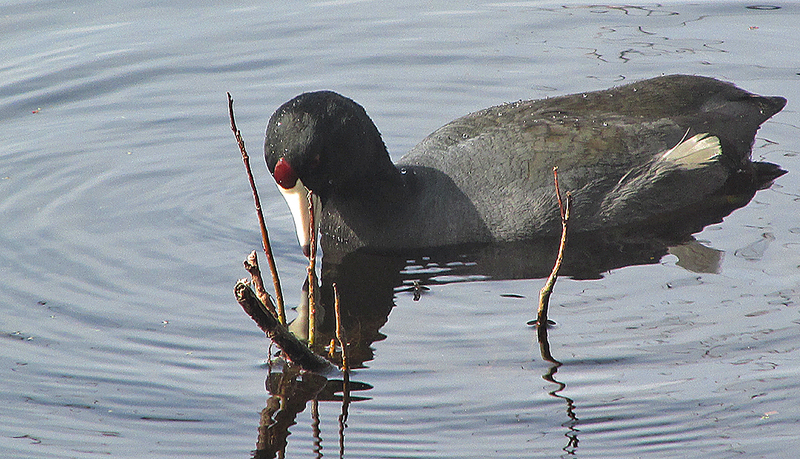 The American Coot is a common species of waterfowl in coastal South Carolina in March. 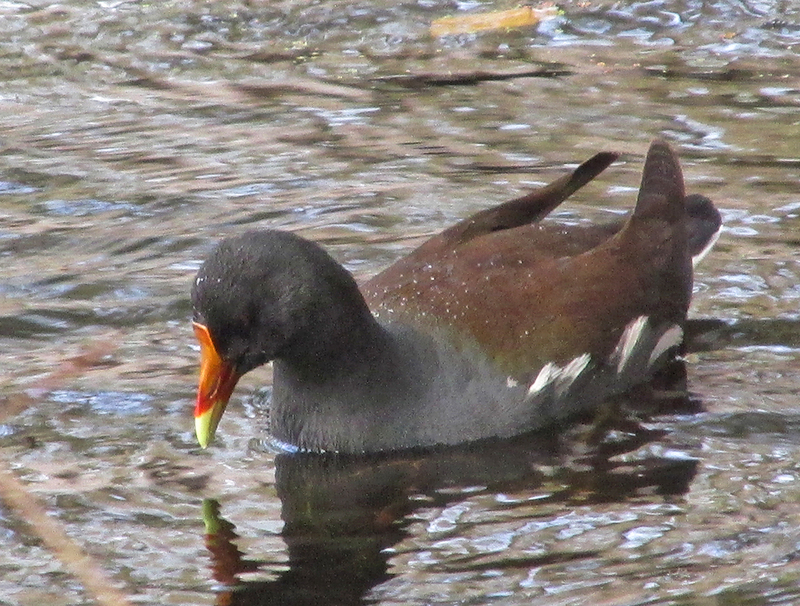 Common Gallinule, formerly known as the Common Moorhen, is fond of some of the flooded woodlands within Huntington Beach State Park. 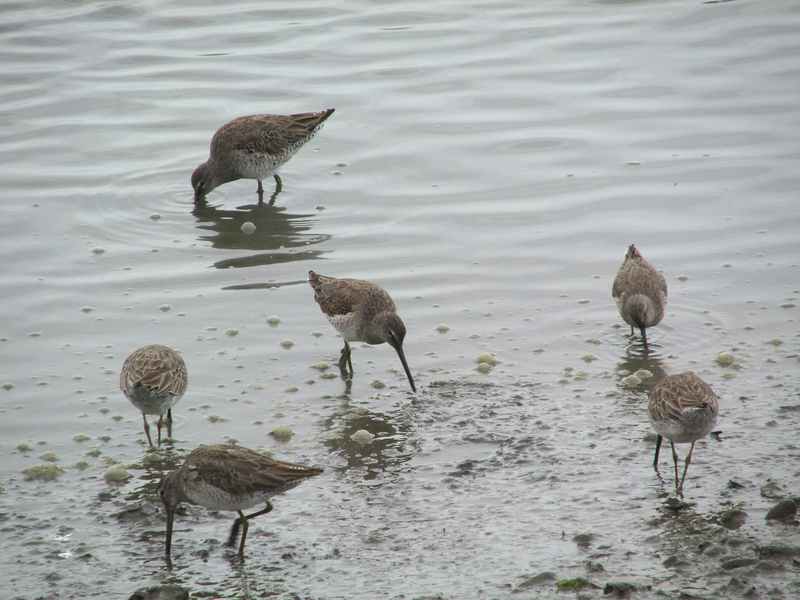 Short-billed Dowitchers make a feeding stop at Huntington Beach State Park. These birds were part of a flock that numbers close to 100 birds. 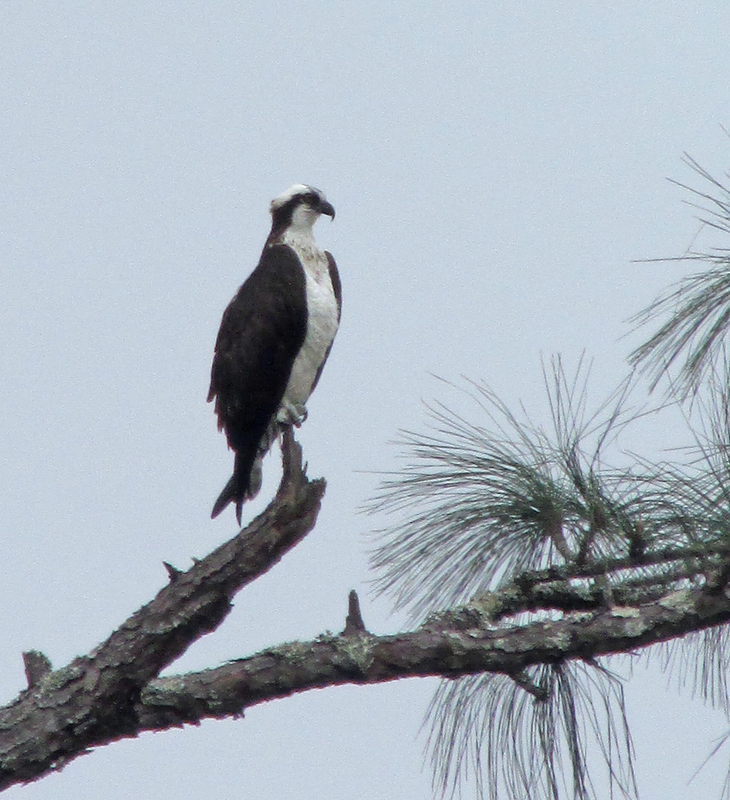 The Osprey, also known as the Fish Eagle or Fish Hawk, is a common sight in the Carolina Low Country. 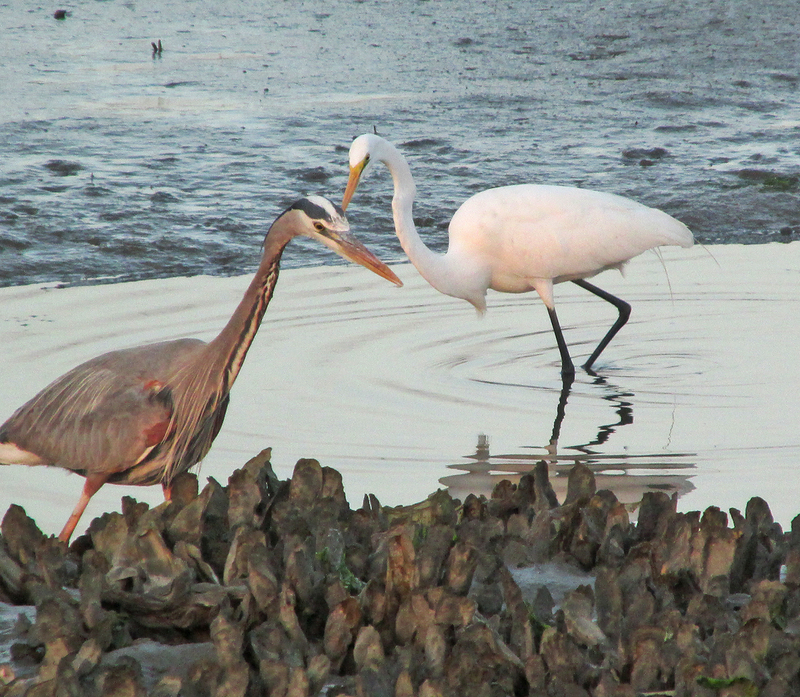 A Great Blue Heron and Great Egret compete for prime fishing turf. 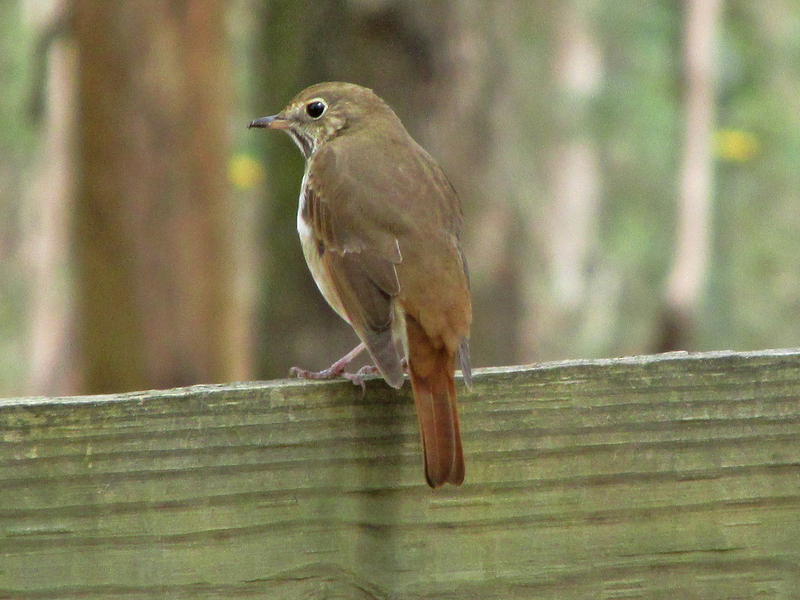 Winter songbirds, such as this Hermit Thrush at Brookgreen Gardens, will soon give way to returning summer nesting birds, such as warblers, vireos and other thrushes. Didn’t think snipes were real? Well, the object of the mythical snipe hunt is very much a real creature. 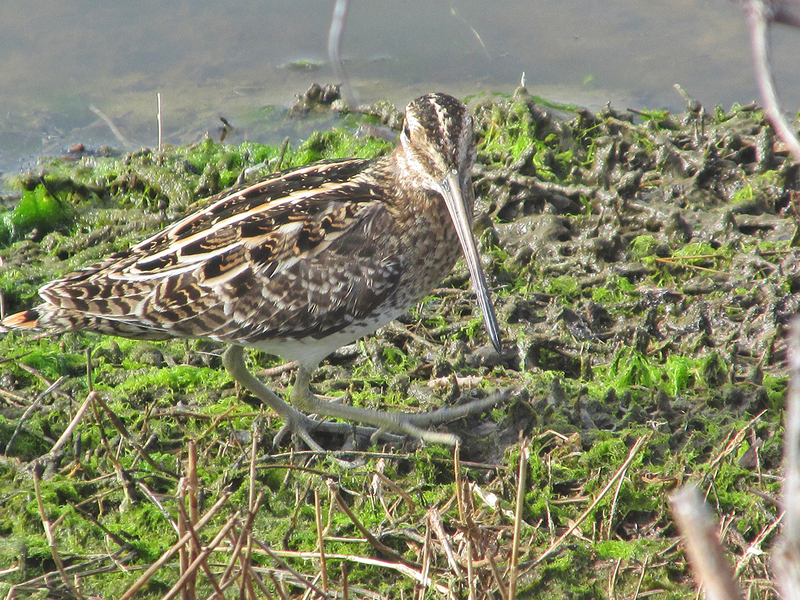 Pictured is a Wilson’s Snipe along the causeway at Huntington Beach State Park. 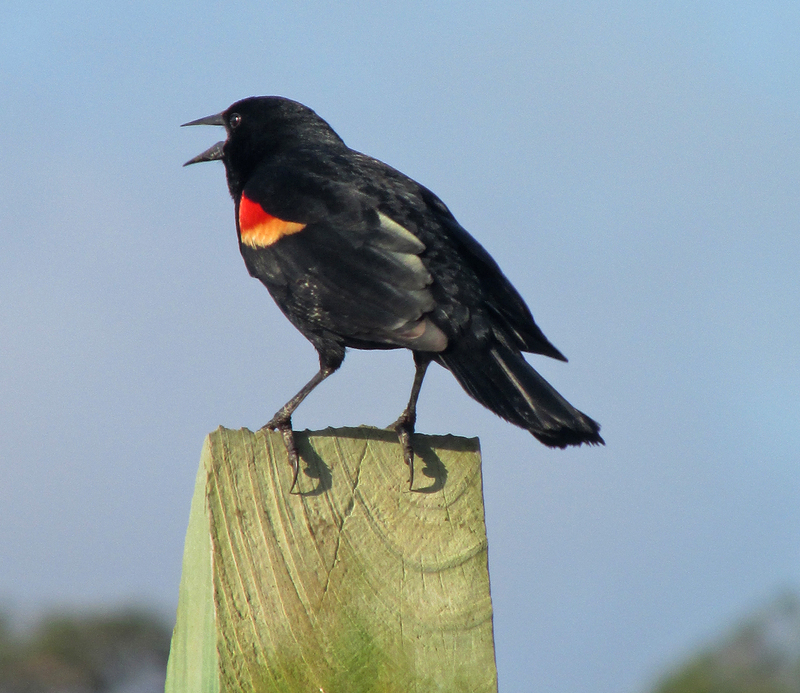 Red-winged Blackbirds and their loud calls are again ringing from the wetlands in the South Carolina Low Country. Brown Pelican perches in the marsh at Huntington Beach State Park. 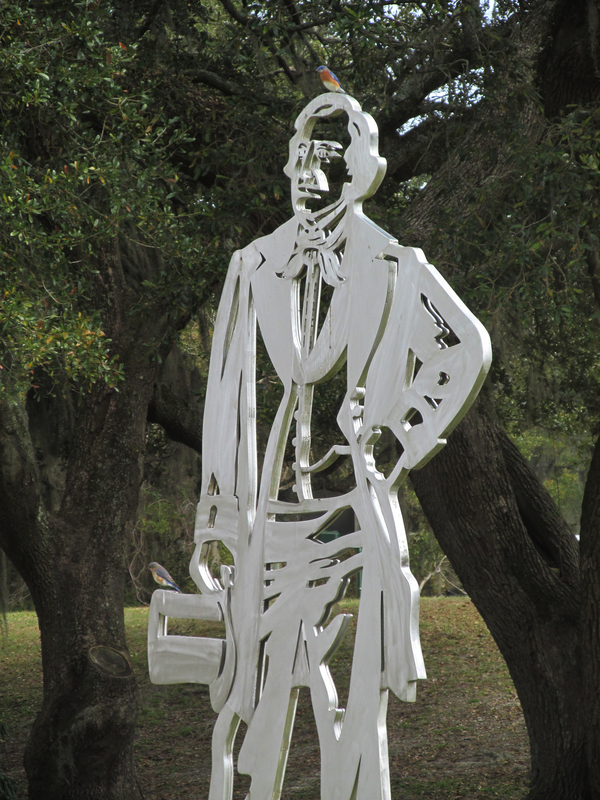 Brookgreen Gardens is renowned for its display of sculptures. For Eastern Bluebirds, such as this pair, the works of art are simply convenient perches. 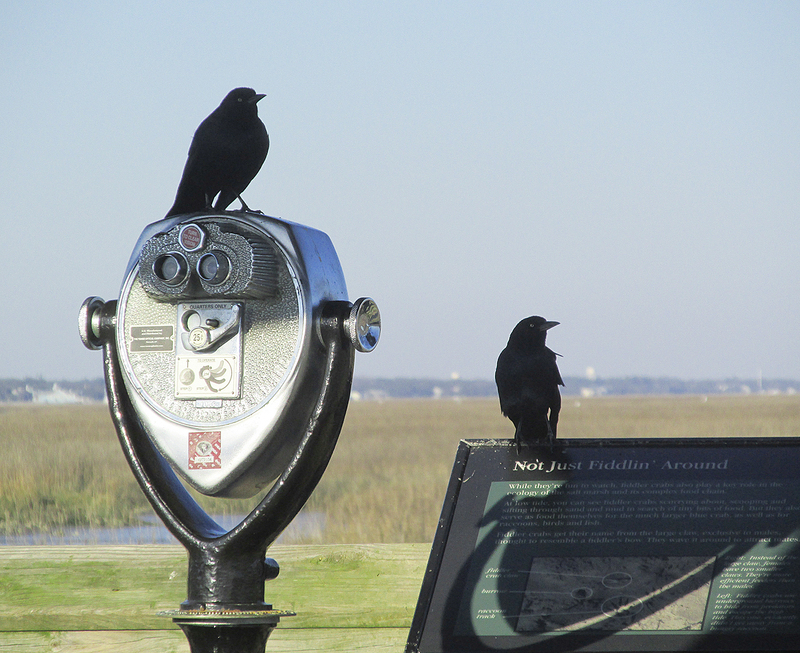 Boat-tailed Grackles perch on a scope and sign at Huntington Beach State Park. 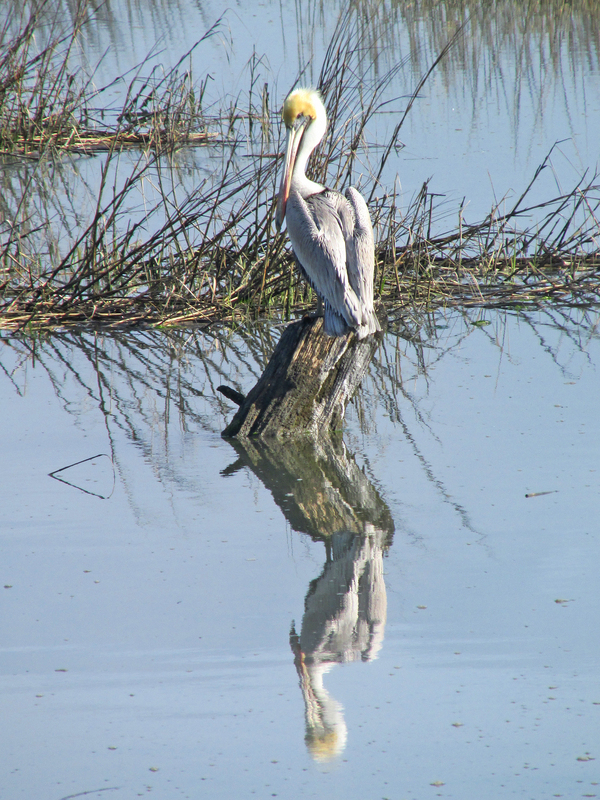 Birding in the transitional period between seasons can also bring unexpected surprises, such as a sighting of White Pelicans at Huntington Beach State Park. 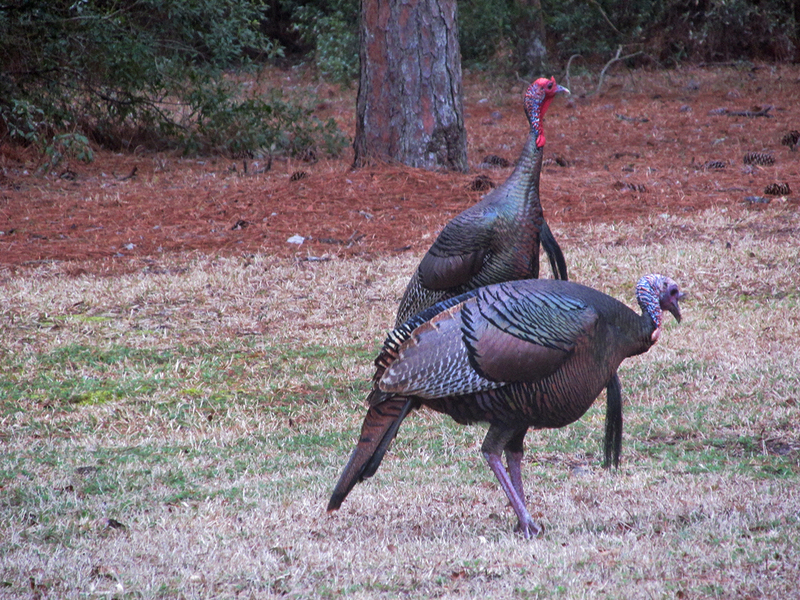 Wild Turkeys stroll the grounds of Brookgreen Gardens. 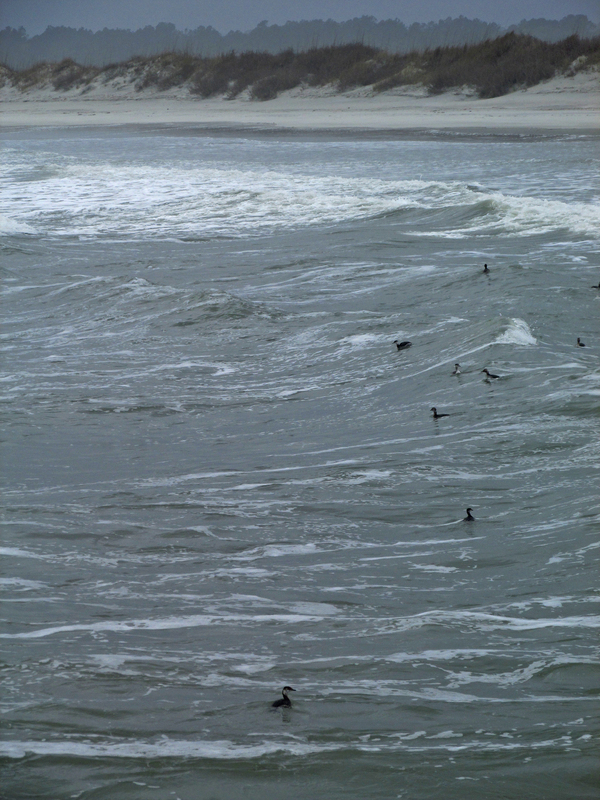 Horned Grebes ride the rough surf near the jetty at Huntington Beach State Park. 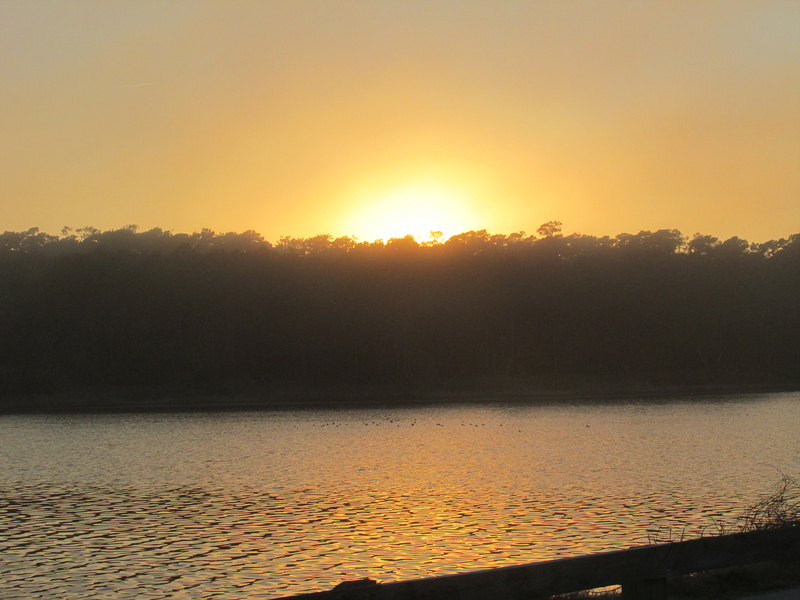 I hope you enjoyed these photos from my recent trip. 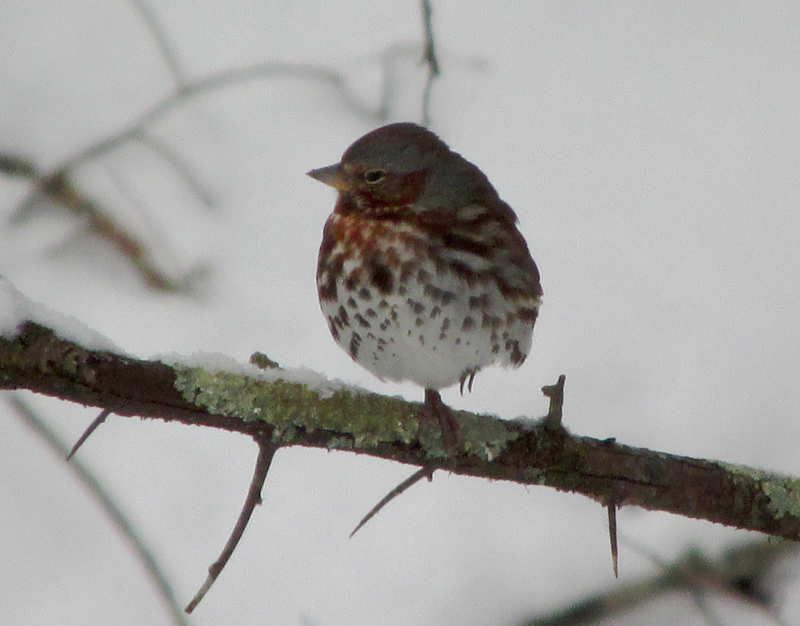 See you next week back in Northeast Tennessee, just in time for the start of spring migration. 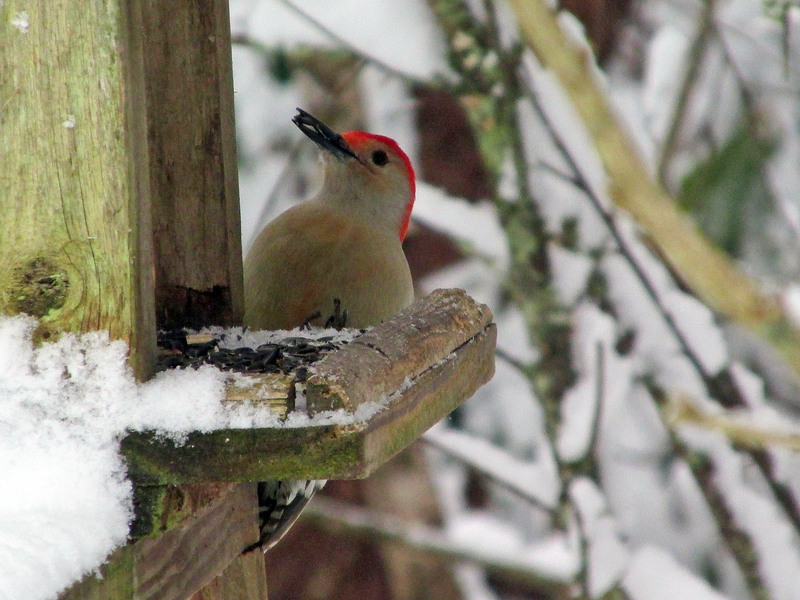 Photo by Bryan Stevens A Red-bellied Woodpecker looks for sunflower seeds at a feeder during a snowstorm. 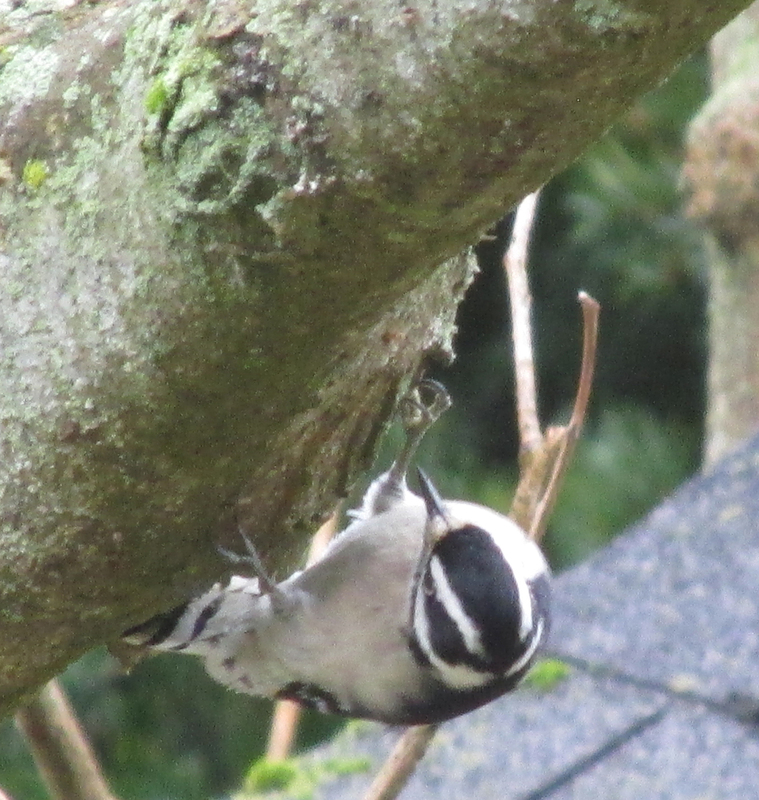 For most woodpeckers, a vertical lifestyle’s not a problem. 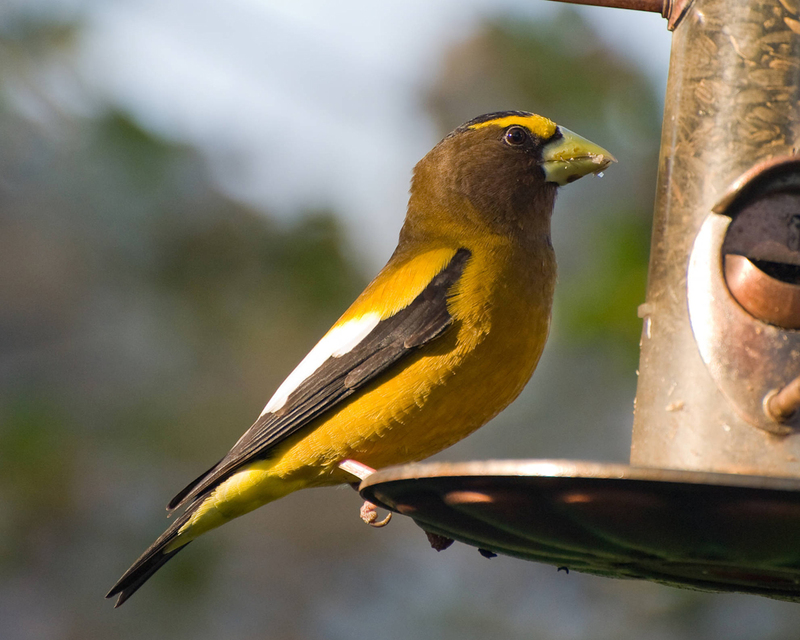 These birds even have amazing adaptations to help them with their specialist lifestyles. For instance, their tail feathers are usually quite stiff to provide a means to prop the body against tree trunks as they excavate into the bark either in search of food or to fashion a roost or nesting site. Since they spend so much of their time hammering against tree trunks, woodpeckers even have special “shock absorbing” cushioning to protect their little bird brains. Photo by Bryan Stevens A male Downy Woodpecker climbs along a branch. 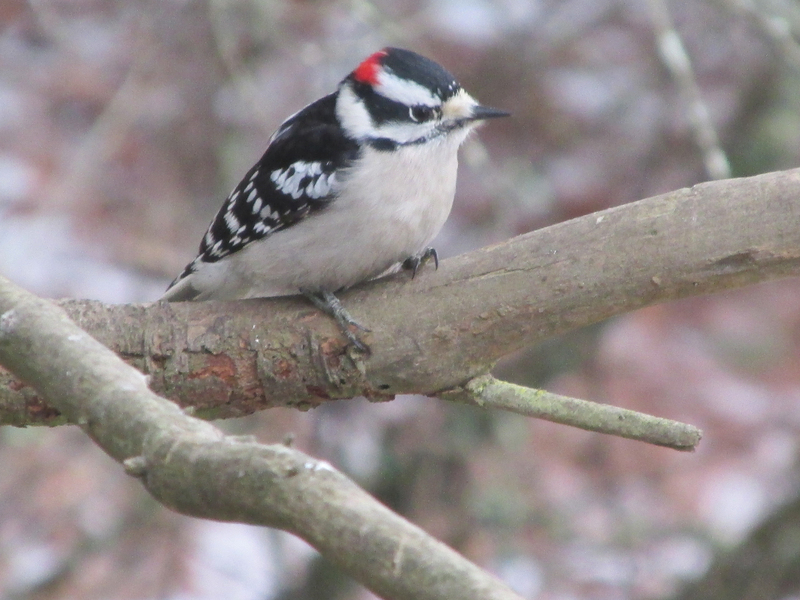 The region is home to seven species of woodpeckers, ranging in size from the sparrow-sized downy woodpecker to the crow-sized pileated woodpecker. English naturalist Mark Catesby, who died in 1749, gave the large pileated woodpecker the name of “large red-crested woodpecker.” Swedish botanist Carolus Linnaeus apparently gave this woodpecker its scientific name of Dryocopus pileatus. The Latin word, pileatus, translates into English as “capped,” and is derived from an old term that literally means “felt cap.” So, apparently, this woodpecker’s red crest reminded early observers of a red cloth cap. Another English naturalist, John Latham, apparently gave the bird the common name of pileated woodpecker, basing the name on the scientific name established by Linnaeus. Photo by U.S. Fish & Wildlife Service The Pileated Woodpecker is surprisingly evasive for such a large bird. 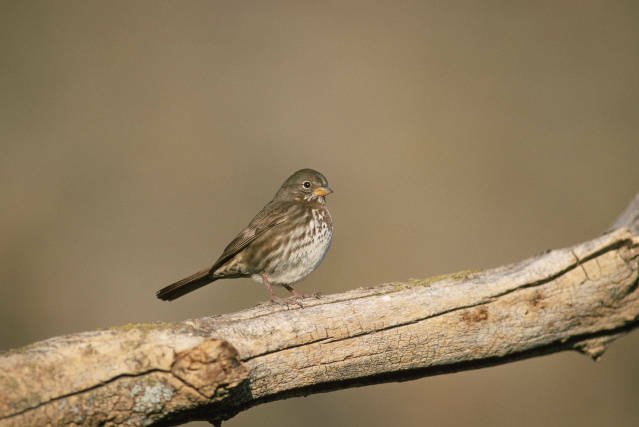 Their presence in a woodland might go unnoticed if not for their noisy vocalizations. The pileated woodpecker has actually had an abundance of common names associated with it, including wood-hen and “Good Lord Bird,” which was inspired by the common exclamation people make when they’re surprised by an unexpected observation of this rather large, often noisy, woodpecker. The loud vocalization of this woodpecker has also inspired names such as wood hen, Indian hen and laughing woodpecker. If anyone knows of other common names for the pileated woodpecker, I’d enjoy hearing about them. Depending on whether you believe that the ivory-billed woodpecker still exists somewhere in Cuba or Arkansas, the pileated woodpecker is the largest of North America’s woodpeckers. Pileated woodpeckers are cavity-nesting birds, and they use their large, stout bills to efficiently excavate their own nesting cavities in dead or dying trees. These cavities can be used in subsequent nesting seasons by such cavity-nesting birds as Eastern screech-owls and wood ducks, which are incapable of excavating their own nesting cavities. 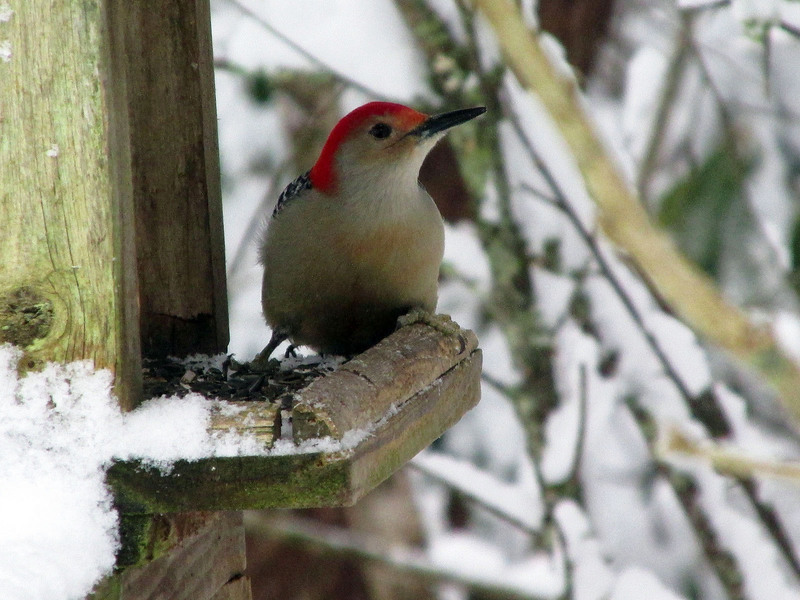 Photo by Bryan Stevens A Red-bellied Woodpecker stops by a feeder during a snowstorm. Male pileated woodpeckers show a red whisker stripe on the side of the face that is absent in the female. Otherwise, the sexes look similar. These large woodpeckers — they can reach a length of about 19 inches — often forage close to the ground on old stumps or fallen logs. 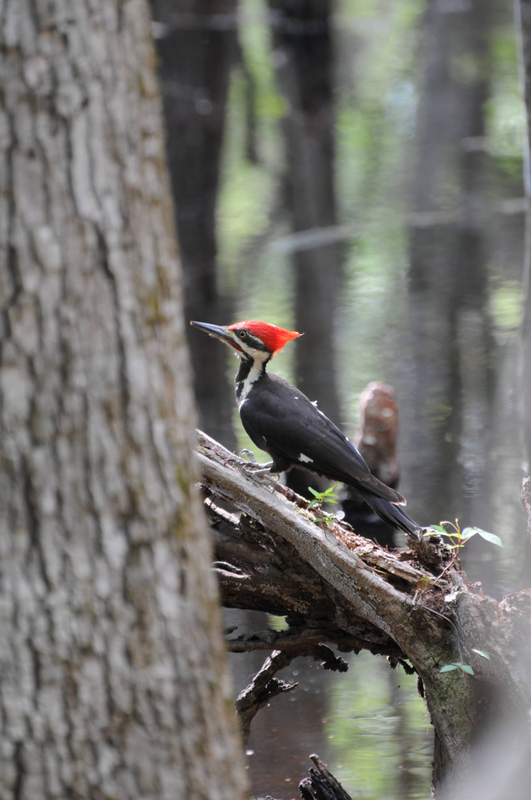 The pileated woodpecker is widespread in the United States and Canada, favoring wooded areas in both countries. This woodpecker has proven adaptable, now thriving even in suburban areas offering sufficient woodland habitat. 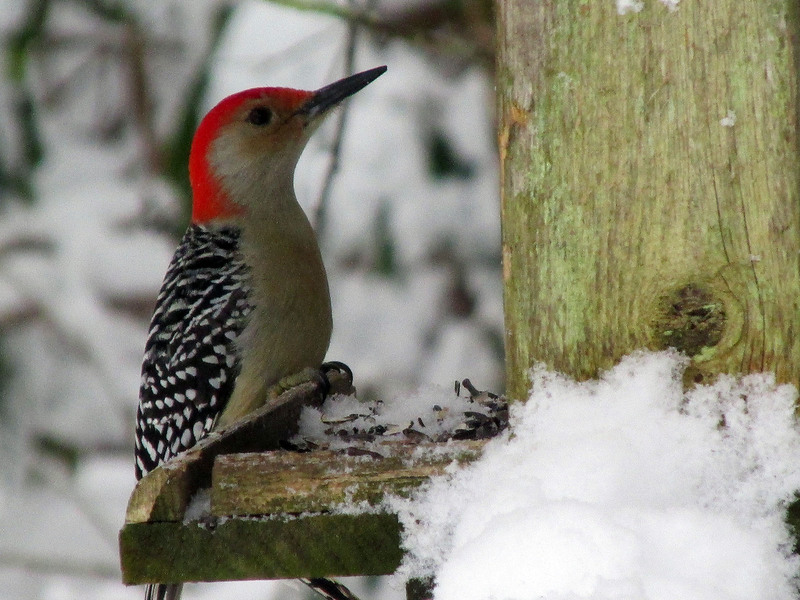 During the recent bout of wintry weather with its abundant snowfall, a pair of red-bellied woodpecker have joined the downy woodpeckers as daily visitors. 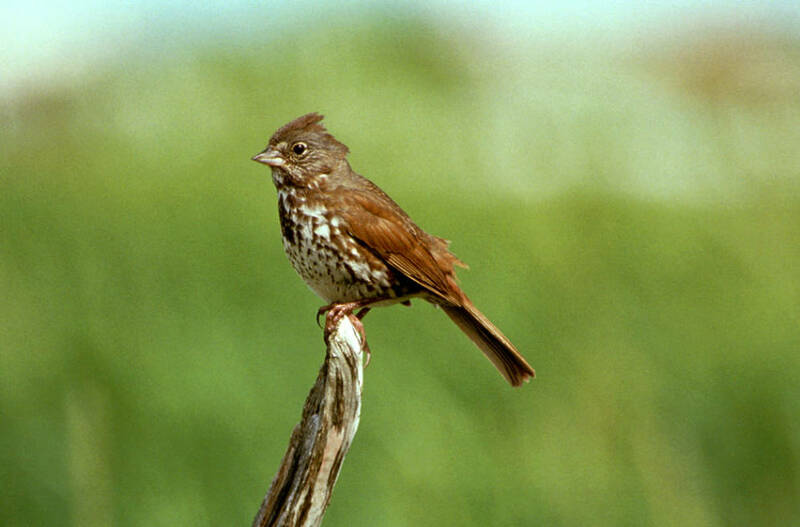 This is a bird that was once considered primarily a resident of the southeastern United States. It has expanded its range northward over the past century. It is often confused with its relative, the red-headed woodpecker. In truth, the red-bellied is named for a feature not readily apparent. 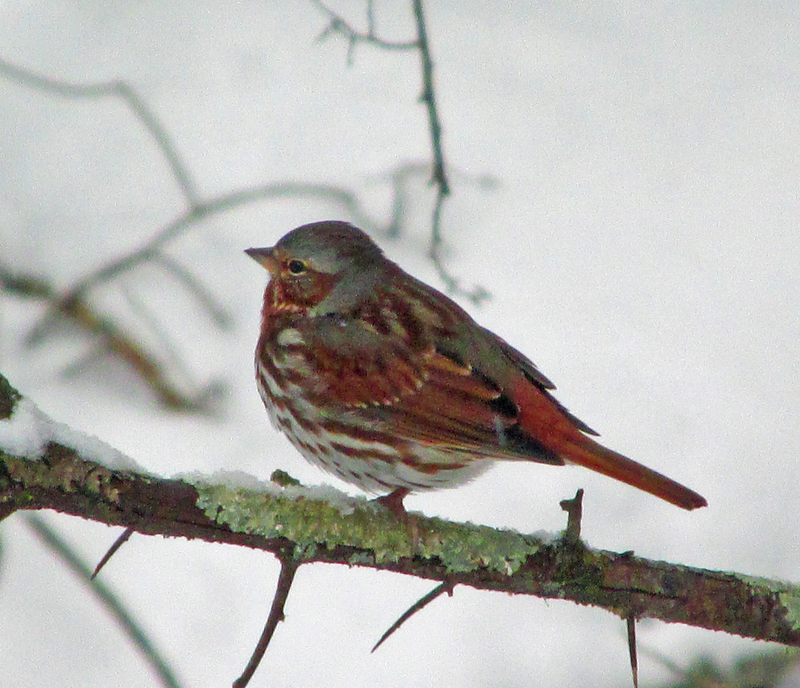 Although it has red feathers on its belly, they are often hidden as the bird clings to the trunk of a tree. Photo by Bryan Stevens A feeder stocked with peanuts attracts a Downy Woodpecker. The downy woodpecker, which occupies the other end of the size scale from its larger relative, is a rather frequent visitor to feeders. This small woodpecker, which is only about six to seven inches in length, frequents a variety of habitats, including open woodlands, parks and well-planted yards. 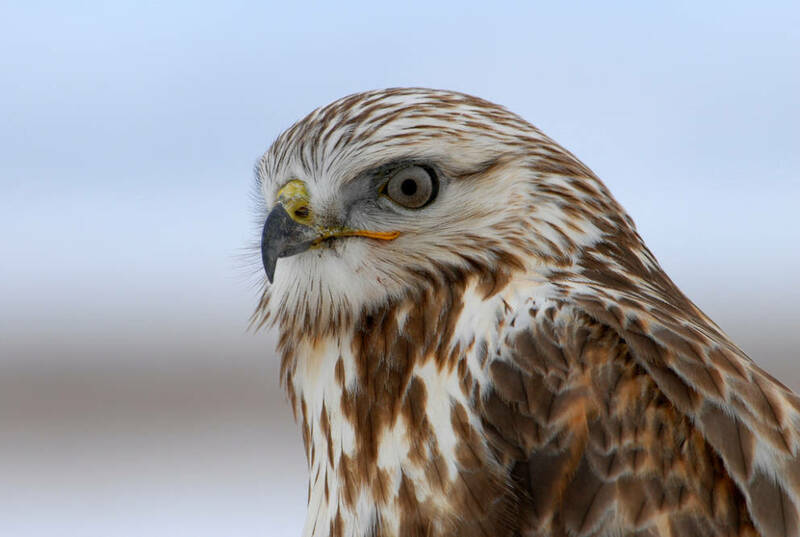 The male shows a red crown patch at the back of the head, a feature which is absent in the female. 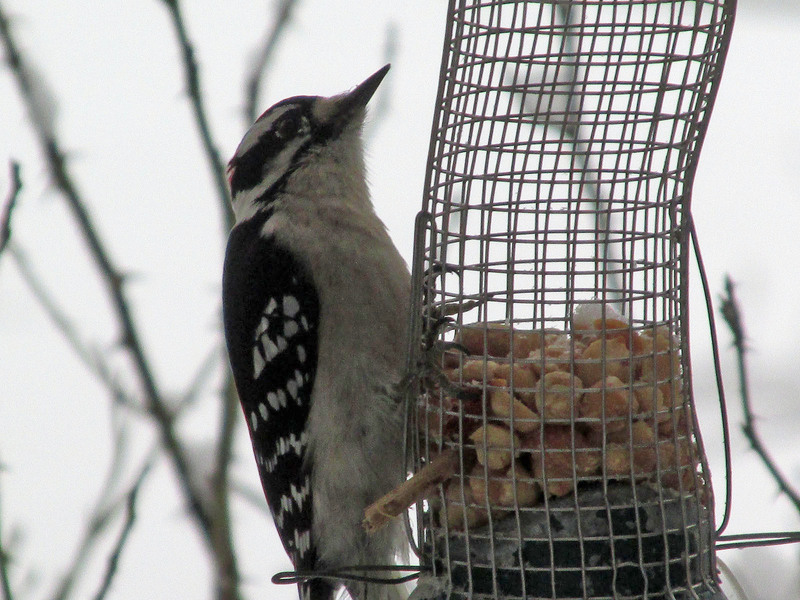 At feeders, downy woodpeckers like sunflower seeds, peanuts and suet cakes. Away from feeders, this small woodpecker is quite efficient at boring into trees in search of insects and their larvae. Photo by Bryan Stevens A Downy Woodpecker clings to the underside of a branch. The other woodpeckers in the region include red-bellied woodpecker, Northern flicker, hairy woodpecker, yellow-bellied sapsucker and red-headed woodpecker. Worldwide, there are about 200 species in the woodpecker family, which also consists of sapsuckers, piculets and wrynecks. Some species have some very colorful names, such as the red-throated wryneck, arrowhead piculet, ochre-collared piculet, black-rumped flameback, crimson-winged woodpecker, imperial woodpecker, brown-capped pygmy woodpecker, splendid woodpecker, melancholy woodpecker and red-naped sapsucker. Photo by Bryan Stevens The Red-bellied Woodpecker is a medium-sized member of the woodpecker family. This entry was posted in Uncategorized on March 1, 2015 by Bryan Stevens.